Floating candles don't have to have round bowls. Floating candle bowls provide a dramatic contrast between fire and water that can make a stylish statement in home décor or for any special occasion. With a wide range of bowl shapes, styles, and decorations to choose from, it is easy to add floating candles to any décor. While any wide, shallow dish can be used for floating candles, there are certain characteristics to consider when choosing a bowl. Size: Most candle bowls are 6-15 inches in diameter, but both larger and smaller sizes can be found. Choose a bowl that is slightly larger than the candle or candles to be floated so they will float freely, but don't choose too big a size where the candles will seem overwhelmed by the water. Depth: A bowl for floating candles should be at least 3-4 inches deep so the candles will float easily with enough space beneath them to highlight the fact that they are floating. Deeper bowls can be filled with decorative accents to anchor the bowl's appearance stylishly. Shape: Round or oval bowls are the most popular for floating candles, but a wide range of other shapes are available. Square and triangular bowls have a chic modern shape, and more unique shapes include bubble bowls, oversized martini styles, pedestal bowls, or extra tall vases. Materials: Glass is the most popular material for candle bowls, but clear plastic bowls can be lighter and more durable if desired. Metal or ceramic bowls can also be used but will not have the same open visibility as glass bowls. Tall vases can be candle bowls. 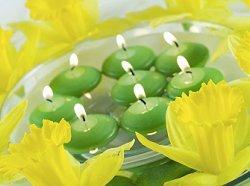 In addition to looking for specialized bowls for floating candles, there are other suitable containers that can work. Check oversized vases and glass centerpiece containers for even more unique bowl styles. Fillers: Adding accents to the bottom of the bowl beneath the surface of the water gives a floating candle centerpiece extra texture and distinction. Popular fillers include shells, pebbles, river rocks, marbles, gravel, sand, and in a unique option, live fish or aquatic plants. Surface Accents: Adding floating accents to the surface of the water in a candle bowl will break up the simple lines of the candles with extra color, texture and detail. Flower petals or small blooms, glass bubbles, or floating leaves are popular options. Candle Styles: Simple round floating candles are the least expensive and most popular, but there are many candle styles that can be floated in bowls for unique decorations. Different colors and scents are available, and floating candles are also available in a range of shapes such as peppermints, rose blossoms, autumn leaves, and snowflakes. Exterior Accents: Adding extra decorations around the base of the bowl can turn a simple centerpiece into a more elaborate decoration. Mirrors, extra votive candles, or sprinkled items that coordinate with the decorations inside the bowl are easy options. With the right bowl and decorative accents, floating candle centerpieces can be superb for holidays, weddings, romantic dinners, or just to add an elegant touch to any décor. Keep the bowl clean and the water fresh and clear. 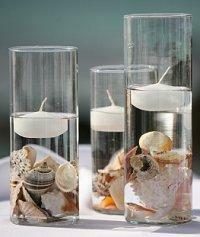 Choose floating accents carefully so they will not interfere with candle's flames. Place bowls on a level, steady surface to avoid tipping or leaking. 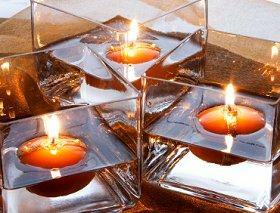 Floating candle bowls can be easy, elegant decorations for any home or party. With a wide range of bowl styles to choose from and many ways to accessorize them, anyone can design a floating candle centerpiece perfect for their tastes.